Does your partner refuse to read any of the amazing articles or books that have inspired your parenting choices? Does he roll his eyes when you ask him to change his approach? Are you feeling frustrated that he’s not doing what you’d ideally want him to do? This is such a common complaint! Particularly by mums. 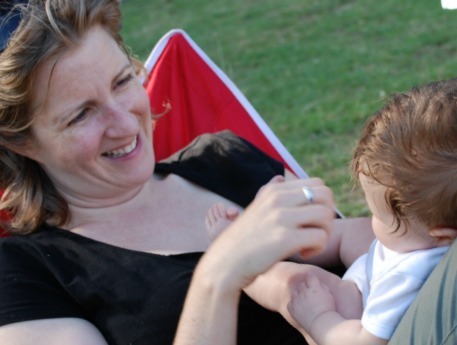 We want the best for our babies and children and are often the ones who do the research – we read the books, join the Facebook groups, meet up in Mothers’ Groups and pretty much interrogate other Mums on what they do. The theory sounds amazing and we’re keen to try it out at home, but then our partners are just. not. interested. They often can’t see what’s wrong with the ‘old’ way – the way their parents treated them – and they are possibly suspicious of all things you’re passionately going on about. This can cause a HUGE amount of friction. Which is obviously not great for your relationship, let alone your children. And yet, once you’ve discovered a newer, more respectful parenting paradigm, you can’t go back to the old way and you can’t bear to think of your children being subjected to it either. I have experienced this a great deal! My husband won’t read anything I’ve given him, won’t come to workshops and finds it hard to engage with the challenging side of an angry or upset child. As you can imagine, I’m pretty passionate about all of this parenting approach, so this has been a big source of friction between us. It’s only taken several years(!) but I am at peace with his lack of enthusiasm for learning about it, and yet am really pleased at how much he has absorbed and what a great dad he is. Many of my clients complain about lack of engagement by their partner, so this webinar is designed to give you my top 10 tips and strategies to use to maintain the integrity of how you want to parent, along with maintaining harmony in your relationship. So don’t allow the irritation to grow into resentment. Come along to hear my top tips and to share any of your own. This is such a common complaint that is worth addressing head-on as early as you can. In the Webinar I talk about Listening Partnerships – CLICK HERE to read Hand in Hand’s article on LPs. WOULD YOU LIKE MORE SUPPORT & STRATEGIES? 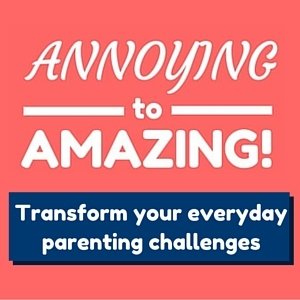 If you want MORE great tips and strategies on parenting compassionately, respectfully and effectively, my ANNOYING to AMAZING course is for you! Over the 4 weeks, we’ll cover Playful Discipline, what to do when your child has a meltdown, how to listen to your child’s upsets, how to help build resilience and confidence, and ultimately create a strong foundation with which to face life’s challenges together. I offer down-to-earth, practical information with really tangible strategies you can easily implement in your family, and there is a supportive exclusive Facebook group within which to vent your frustrations, ask for advice and share successes.